For fans wondering how Cassian met K2-SO and reprogrammed the droid, this is the comic for them. Cassian is sent on a mission to obtain Imperial security protocols; the mission ends up taking a turn for the worse and leaves the Rebel needing to improvise, leading to K2-SO the Imperial droid being reprogrammed in order to help Cassian and his Rebel allies escape. The way in which Cassian is portrayed in the comic is exactly what you would expect after seeing him in Rogue One, quite edgy, and quick to act if it’s required as seen in Rogue One when he killed a contact because he wouldn’t be able to escape Imperial Stormtroopers. Cassian also has an easy going persona that is apparent throughout this comic. Cassian is joined by two rather interesting aliens on his mission, Kertas and Rismor; the pair communicates primarily through producing smells for one another, which isn’t ideal for Cassian as he is then out of the loop. Droid rights have been an interesting topic over the last year or so since the release of Solo: A Star Wars Story; especially with L3-37 initiating and aiding the droid liberation on Kessel during the film. The topic came up during this comic when K2 asks Cassian whether the droid has a choice or not before being reprogrammed, which in some cases questions whether K2 wanted it to happen. On the other hand, by Cassian doing what he did, it did allow K2 more independence and the ability to make his own choices. 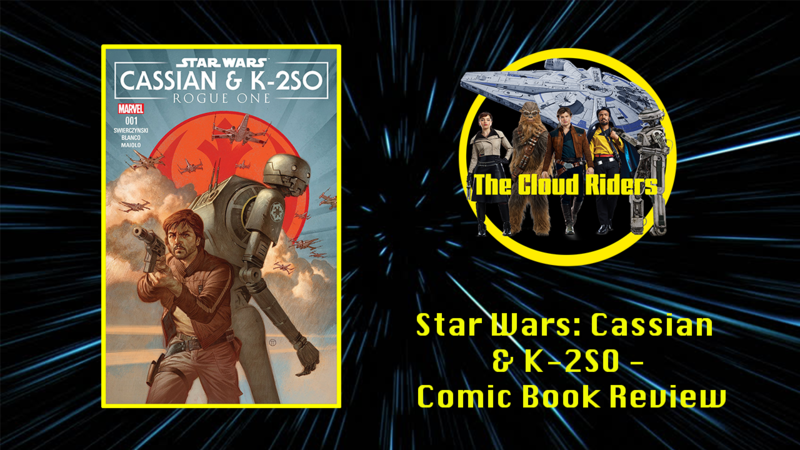 Cassian and K2-SO is an adventurous story that provides readers with a reason to turn the pages. Writer Duane Swierczynski captures the spirit of Cassian and K2 as well as introducing other characters to the equation. With regards to the art, it truly reflects the spirit of Rogue One with great visuals al round regardless of whether it’s an action sequence, or a conversation between characters.